The only fail here is you, go troll some other website! UK: The 3 versions are still sold. I can re-add the pages and put and put the laptimes were they belong if you want, with differentiation like GTR (512PS), GTR (600PS). time delted..feel free to add it to a other off the trillion Mosler MT900 versions... nearly every Mosler build looks like a new version of the same car.. This is not the same car that hit he time in Virginia. This car Did NOT do the VIR lap of 2:45, it was the MT900S, Fitted with a 550bhp LS7, somebody please change it!!!! Can somebody Remove that VIR laptime? that was done by the Mosler MT900s fitted with a 550bhp LS3. those stats for the GTR are correct and it is tru that the MT900 that did the vir lap was the 550bhp mod. the weird thing i fin is that the one that did the vir lap costed $345,000 and the GTR costed $215,000 and the GTR is superior in every way..Strange.. Seeing how the Viper ACR just set the new Nurburgring record this needs to be tested because it will win. Then America will have the top two spots and the ZR1 maybe 3rd. Take that Europe. There is a lot of bad data here. The GTR has 600hp, 470 lb-ft, 0-60: 3.0 0-100: 6.3 top speed:212 1/4: 10.8@136 weight: 2100 lbs. The VIR time is the 550hp MT900s. This car does look HOT, but why does it not get attention like other supercars? I mean if it can lap out a VIPER ACR then it definitly has balls. this car didnt runthe VIR time of 2:45 it was the MT900S..
anybody got the data sheet VIRWtest of this baby??? Where's the MT900SC the most powerful version built in America with 620bhp? if this cars 0-124mph is 10.8 why dose it pass the 1/4 mile at 10.8@136?? 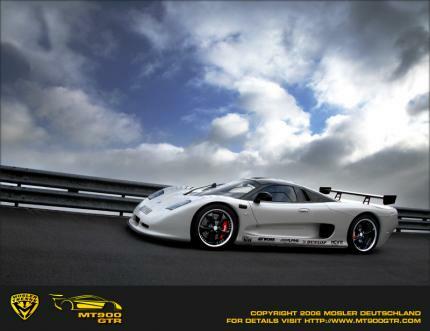 no the car is street legal with licens plate the tested car in sportauto was the same as on the picture (I copyed from Mosler Germany Homepage) the Mosler MT 900 GTR is full street legal in Germany and the rest of europe..